Erica Schoenberg is a relative newcomer to the game of poker. She has learned quickly, though, and had some impressive finishes already. Professional poker may be new to her, but living in Las Vegas, Nevada, and being brought up in a family like hers, gambling certainly is not. One of her hobbies is playing Blackjack hence her nickname Blackjack Babe and can often be found over at the Blackjack tables when she is missing from the poker table. Erica’s parents met, of all places, at a racetrack. They were betting on the races at Santa Anita in Acadia, California, when they got together. It is no wonder then that family life at the Schoenbergs’ place was wrapped up in gambling. Schoenberg was born in 1978 in Akron, Ohio. From the time she could understand the concept of gambling, Erica joined in the family habit of betting on any situation that arose. They bet on everything. She used it to gain a little extra allowance, or to get out of doing chores. There were three stations on TV where Schoenberg grew up, yet she was never bored. Maths and logic fascinated her. Her trips with her father to the local racetrack prepared her for her future life. She soon won a county maths competition with her skills. Schoenberg went to college, surprisingly, to study theatre. She did well, and graduated with a degree. Yet, she did not pursue an acting career. Instead, she modelled and worked as a personal trainer after college. At this same time, Schoenberg started adding to her regular earnings by playing blackjack. At one point, she got help with her blackjack game from a member of the MIT Blackjack team. This was professional instruction that improved her game immensely. Before long, she was playing in the World Series of Blackjack. This was a series put on by the Game Show Network. She finished second in her episode. Although she loved blackjack, she started playing Hold ‘em poker as well. Poker became Erica Schoenberg’s main game, and just like that, she went from being called the “Blackjack Babe” to being called the “Poker Babe.” Her first tournament was the Five Star World Poker Classic WPT No Limit Hold ‘em Championship. She came in at a respectable 16th place and cashed over $117,000. Schoenberg had another major tournament finish with the Bellagio Five Diamond World Poker Classic WPT, where she made a 5th place finish. This was a good start, but it was only the beginning. Also, in 2006, Erica won the Mandalay Bay No Limit Hold ‘em Championship event. The money was over $105,000, but the important thing was the first place win. In 2007, Schoenberg placed third in the World Series of Poker No Limit Hold ‘em event. For this, she had a payday of over $261,000. She also appeared on the WPT’s season four Ladies’ Night where she placed fourth. Erica Schoenberg has career earnings of $848,458. She is a tight but aggressive player who is making a name for herself very quickly. With Schoenberg’s background and experience, she is sure to become a big name in the poker industry. 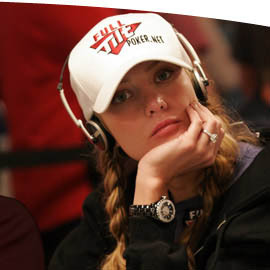 She plays poker online, too, and was a former sponsored player at Full Tilt Poker. She is no longer part of the FullTilt Professional team but she still plays there and is often found chatting to her fans (often male fans!). Want to Chat and Play Poker with Erica Schoenberg?